The WPRichSnippets plugin support several schema.org markup types and their sub schemas. On this page you will find out which schema types are supported in the plugin. An article, such as a news article or piece of investigative report. You can mark up your articles with structured data, providing details such as the headline, images, publish date and description. Google may use your rich snippet markup to power features like “In the news” and content carousels. This is a typical editor or author review, the most simply and straight forward way to add markup for reviews, practically reviewing anything! When Google finds valid reviews or ratings markup, it may show a rich snippet that includes stars and other summary info from reviews or ratings. Reviews has two ways to present in Google’s rich snippets, rating and percentage. Mark up your recipe content with structured data to provide rich cards and host-specific lists for your recipes, such as reviewer ratings, cooking and preparation times, and nutrition information. If you’re a merchant, you can give Google detailed product information to display rich snippets (for example, price and review ratings) right on Google’s search results pages. Products can be set to rating, percentage, votes and aggregate user reviews. Organization schema can get votes and aggregate user reviews. This markup is used to tell Google that content is about a Restaurant. A Restaurant can get votes and aggregate user reviews. When you mark up software application information in the body of a web page, Google can identify it and, when users search for apps, use this information to better display your app details in search results. Software Applications can get votes and aggregate user reviews. 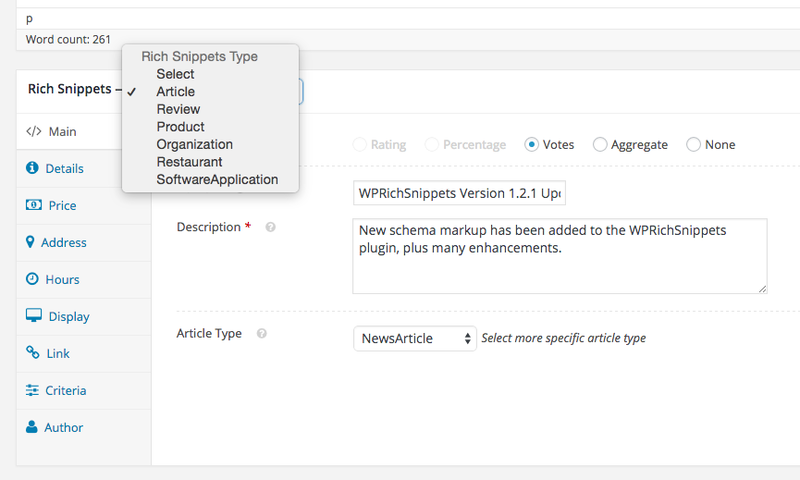 See also Review Types that is supported via the WPRichSnippets plugin.